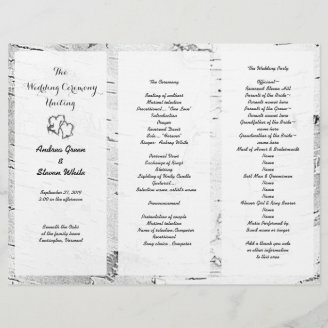 When you choose a Zazzle template to create your own tri-fold wedding program, not only will you save money, but you'll have complete control over the text. But the best thing is that it will be printed on paper in your choice of theme. With the stunning array of wedding designers to choose from, your ceremony program will match any theme. Or choose plain black and white or neutral colors. The programs listed here will come on flat paper that must be folded by the customer. Add text to three sections. To create your personal, custom wedding program that will fold in thirds, gather all wedding information. It may be most helpful to print it up on a word program to check spelling ahead of time. The programs will not be proof read before shipping. Begin with the left side template where the title, names, venue, date and location will be added. The center panel will hold the order of the ceremony. If your ceremony will be short, and there is additional space here, include a thank you message to guests. The right hand side of the paper will hold the names of the parents, wedding party, officiant, readers, musicians, etc. as you prefer. This one comes in black, or choose another color. These wedding programs are printed on 8.5 by 11 inch size paper which offers six types from matte to satin. Bulk discounts begin at 10 sheets. Carefully check all wording for errors as no one will proofread your program. All printing will be done on one side. It will then be folded like an accordion to become a tall program that unfolds for guests. Some of my program templates offer a place for a photo of the couple. The tri-fold program has a photo template on the front near the names. Each section of the program will have templates to carefully fill with your wording. Double check for errors in spelling! The sample text is just that. You may want to set up the wording differently and that is fine. Zazzle had programs to match most wedding themes. 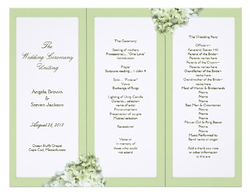 You should be able to find a tri-fold wedding program at the Zazzle site to match your wedding theme. Most paper contains floral designs, tropical images, or country themed burlap and lace. But plain paper to match a neutral palette can also be found. If you need help adding more text, or making the wording look correct, please contact the designer of the paper. Designers are usually happy to help the customer get it right. The spell checking, and name spelling is up to the customer. Always review your finish product carefully before buying. Carved hearts design in black and white for a country wedding. Most couples choose to have wedding programs at their ceremonies. The exception may be a very small, private event. Programs not only tell guests what is happening during the ceremony, they list the important members of the ceremony who helped make the day special. A lot of work goes into planning a wedding, and the program acknowledges the officiant, musicians, and readers. A thank you note can be included to thank guests also. Tri-fold programs are just one type, and popular options are the fold-in-half and flat programs. Outdoor weddings often use fan programs to keep guests cool on a hot day. Do you think wedding programs are necessary? Thanks for your input Mira. So you like the borders? I used to use borders all the time, but I wasn't sure couple's liked them. I do have hydrangea tri-fold programs with transparent white over the floral background. I will have to add one of them to this page! The one I like best is the beach-themed one shown to the right! I like that it has those borders and that the heart straddles two of the thirds. Have you tried them with hydrangeas and then the three sections with rectangles in semitransparency, or does that not work? These are so pretty. The birch and heart design is very sophisticated and chic! Thank you for that information on the Indian marriage ceremony. From what I've seen, traditional Indian marriages are beautiful and involved. The tri- fold looks artistic and useful. The wedding program is an essential part of the planning if you choose to invite guests for certain functions. In Indian context, there is an important focal point like "Muhurth" for marriage in which all traditional things are performed, followed by a reception. More elaborate weddings can last for more than 2 days.